Fiber carbon roadster, that will operate on gasoline, CNG and hydrogen. The multi-fuel car will create near 600HP on the varied fuels. The hydrogen fuel roadster will create no pollution. There are several body designs currently under development. The mono-coque chassis is using reuse parts as an element of the company’s earth stewardship program. Available engines will be: Mercedes Benz V12 twin turbo-charged, BMW V12 twin-turbo charged and GM LT1 small block 427CI twin-turbo charged. Design and construction of a new car using remanufactured and/or repurposed parts, new parts are integrated with the reuse parts. The form of the car can be a wide range of vehicles to fit a broad market. A comparable market niche is Barrett-Jackson collector car auctions. One of their market niches is “retro-mods”: high end, one-of-a-kind autos with a yesteryear look and feel. 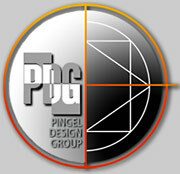 PDG–Pingel Design Group is currently designing and developing a wheelchair accessible motorcycle. The Trident™ wheelchair motorcycle is designed to accomodate any type of wheelchair, including electric wheelchairs. The minimalist design approach captures the look and feel of a traditional motorcycle.